Historic Bartram's Garden is paradise in SW Philly should be just a short bike ride for hundreds of thousands of Philadelphians. But with high speed arterial roads in the way better bicycle access is needed. The complete the Schuylkill River Trail campaign offers a future trail connection to this historic landmark but construction of the Grays Ferry-Bartram section of the Trail is a long way off. The Grays Ferry Bridge is designed for high speeds and there is a significant elevation rise, but it does have bike lanes. 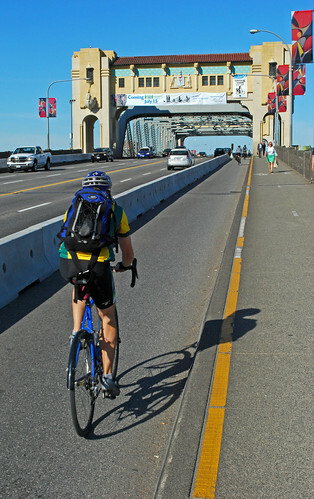 A temporary barricade like the one on the Burrard Bridge in Vancouver (see below) would provide a more comfortable crossing and encourage the use of this bridge. Defining a bicycle jughandle left at 47th on to Paschall would enable a comfortable left turn down Paschall without merging into the left turn lane on Grays Ferry. 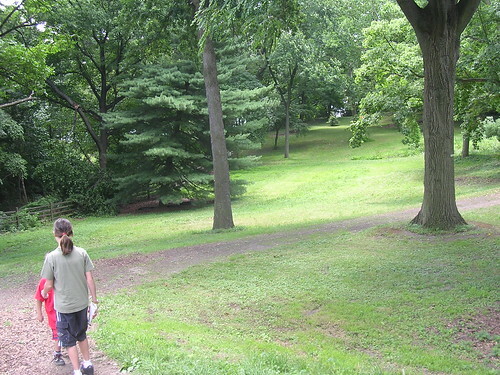 This is not the only difficulty on the route to Bartram's Garden, in future posts we'll look at other sections.